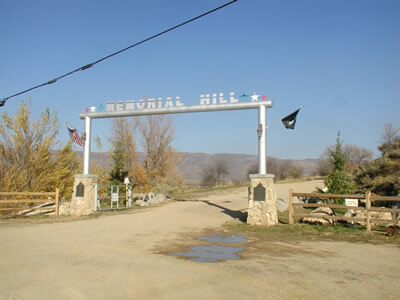 The property which now includes "Memorial Hill," was owned at one time by Jesse Hughes McCarrell, Lovingly known as "Uncle Jesse", and the hill was known as "Uncle Jesse's Mound", for many years. Later, Elijah Watkins owned it, and eventually the county purchased his holdings and the hill and surrounding land for the purpose of memorializing our War Veterans for several wars. 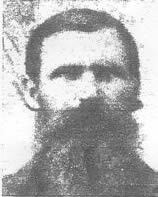 Under the direction of David A. Broadbent, and Officers of the Lockhart Post of the American Legion, legislation was sought from Utah State, to levy local taxes for memorial purposes. With these funds, the Wasatch County was able to purchase said lands. Further personal supervision of Mr. Broadbent, guided the building of the spiral road around the hill to the top, and memorial pillars were installed with brass plaques with veterans' names inscribed thereon. It appears the project was concluded about 1927. Later, vandals stole the precious plaques with complete lists of names of Veterans from this area who had served in all wars. There was a revived effort to collect names of all the Veterans again, initiated in about 1990. Few records were found, so, a concerned effort of a committee with the help of the Wasatch Wave, finally retrieved most of the names lost. Jesse Hughes McCarrell, son of Jesse McCarrell and Mary Hughes McCarrell. Born March 26, 1825, in Louisiana. Married Amanda Wood in 1848. Jesse and Amanda Wood McCarrell were pioneers of Midway, They lived in the Fort. Mr. and Mrs. McCarrell owned the land at the foot of what is now called "Memorial Hill'. Until recent years the mound named for Mr. McCarrell was called "Jesse's Mound". Mr. McCarrell was a sturdy intrepid colonizer. He raised cattle said to be among the best in the valley. He and his good wife came from honorable families. They contributed much to the building of our valley. A report is remembered that Jesse McCarrell helped to finance more than one LDS Missionary who could not have gone except for the generosity of this good man.